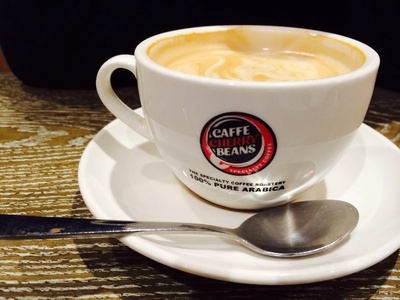 Cafe Cherry Beans is one franchise cafe that has never disappointed me when it comes to coffee. Their promise is good coffee, and good coffee is what they deliver. 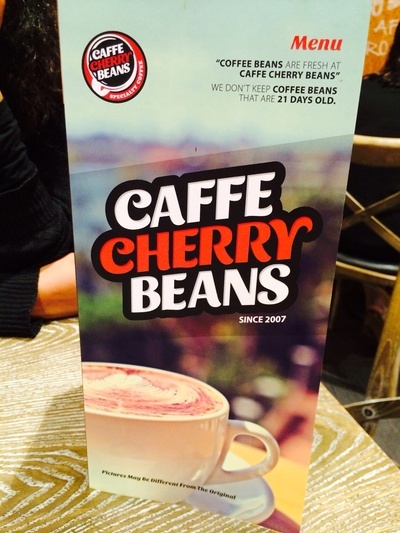 "We dont keep coffee beans that are 21 days old" - of which is their slogan hanging on the wall, of which is definitely un-noticed as you walk into Cafe Cherry Beans, Bella Vista, which is conveniently located in the Norwest business area. Since its location is so close to my work place, Cafe Cherry Beans, Bella Vista has slowly taken the place as my go to place for a quick coffee. Many of my visits to the cafe are hurried on a small break from work, but there are times that I bring my work to the cafe, sit and have a bite to eat. The place is always busy, but I have never failed to find a spot to sit and work. You clearly should not expect quietness in this cafe. 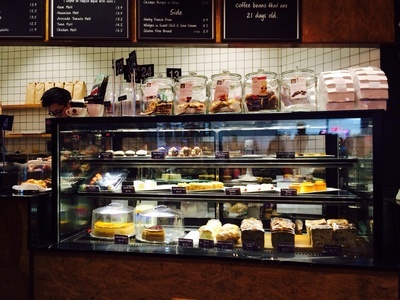 Though the busyness in the Cafe goes hand in hand with the loudness, it had never bothered me. My Cherry Beans experiences have always been pleasant. The staff at the cafe are cheerful and efficient. The service however could sometimes be a bit slow if you are opting to sit and eat, but that is expected of a busy cafe of this nature. Though the staff try to make things happen quicker, sometimes the wait is unexpectedly long. This is not so when it comes to take away. The staff there are alert, and they know their regular patrons well enough to place their orders even before they reach the counter. 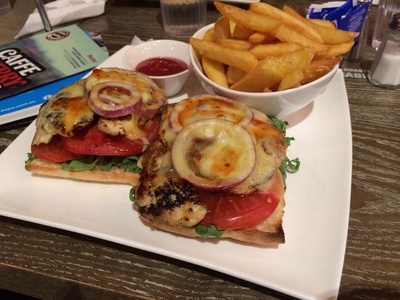 Although I haven't tasted the majority of the meals available on the menu; but from what I have tasted I can recommend Cherry Beans, Bella Vista not only for the excellent coffee they serve, but also for the meals that are available. My favourite breakfast option has to be the Eggs Benedict with salmon. This meal comes with two Poached eggs on English muffins, topped with a generous dollop of hollandaise sauce. This and other breakfast options being available through-out the day is quite attractive to me, as it gives more choice when it comes to ordering a meal. My usual white chocolate mocha ($4.20) is at its best at Cherry Beans. The exact amount of chocolate is added not to create too much sweetness. In my opinion, a white chocolate mocha should be just that, and should not taste like a white hot chocolate. The barista at Cafe Cherry beans gets this balance right all the time. 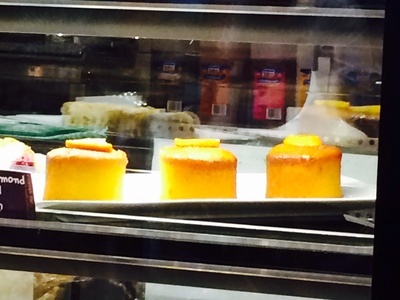 The cake choice of the day is one I often end up with. For just $ 4.90, you get quite a large piece of a chosen cake which is more than enough to share with a friend over a coffee. 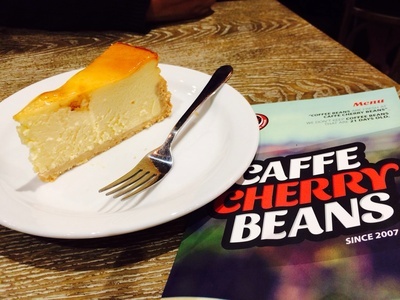 Cafe Cherry Beans in Bella vista is surely a place to go for that relaxed cafe experience. 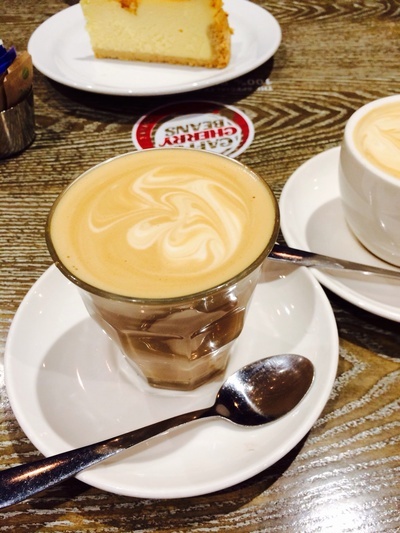 A good cup of coffee is an absolute bonus. Where: Norwest Town Baulkham Hills NSW.